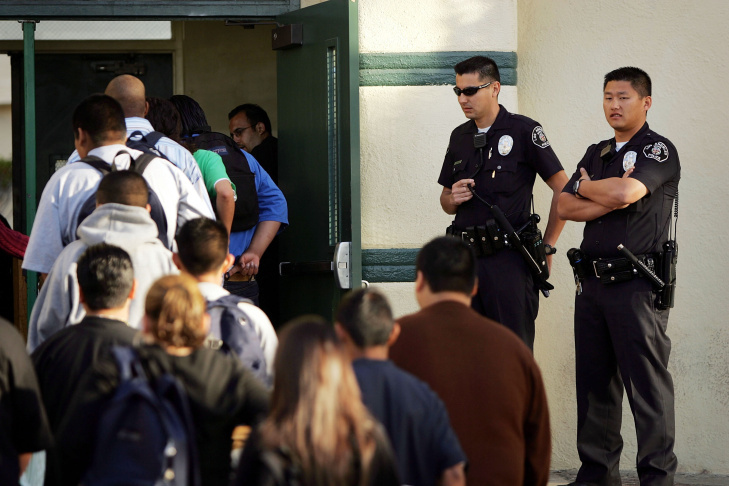 David McNew/Getty Images - Los Angeles School Police officers watch students lining up to pass through a security check point in the aftermath of two apparent racially motivated student brawls at Thomas Jefferson High School April 21, 2005 in Los Angeles, California. The L.A. Unified School District has required all of its secondary schools to perform daily random screenings using metal detectors since an incident 20 years ago, and security has become a top concern again following the recent school shootings at Sandy Hook Elementary in Newtown, Conn.
August 26th, 2013, 6:33am :: On January 21, 1993, Demetrius Rice was shot at Fairfax High School when a gun hidden away in a classmate's backpack accidentally fired. The bullet passed through another student before striking 16-year-old Rice, and killing him. Twenty years later, metal detectors are still in schools. L.A. Unified requires that all of its secondary schools perform daily random screenings using the devices. At one of the, Gardena High School, students streamed through the front gate last Tuesday morning, just minutes before the bell. School dean Daron Andrade and a campus aide stopped random students and inspected the contents of their backpacks before scanning them with handheld detectors. Gardena faced scrutiny in 2011 after a gun that a student brought onto campus accidentally fired in a class room, injuring two students, one critically. The incident shared many similarities with the Fairfax shooting in 1993, prompting the district to investigate whether schools were adhering to the then-18-year-old policy. “Because of the shooting at Gardena High School, we, across the board at L.A. Unified, really started being a little more conscientious about wanding. Every high school has because of that,” Andrade said. Security at schools has become a big issue since the fatal shooting at Sandy Hook Elementary School in Newtown, Conn.
Of the 30 largest school districts in California, the majority reported reviewing their safety plans after the Sandy Hook tragedy, and 19 amended them, according to a report released in August by EdSource. Chart: EdSource, a nonprofit organization that analyzes the California education system, examined stress factors in the state's 30 largest school districts. In January, a few weeks after the Newtown shooting, Los Angeles Unified announced it would spend $4.2 million to hire 1,087 additional campus aides to provide extra security at its elementary schools. School officials said more money has been earmarked in the budget to keep them on this year. It's unclear how long the extra security will remain in place. But if the experience with metal detectors is any sign, the policies put in place after Sandy Hook may be with us for decades to come - whether or not they work. Metal detectors are “an expeditious and quick solution that makes people happy, but I think it does not necessarily get to the root of the problem," said Abigail Hankin-Wei, the author a 2011 study on their effectiveness. By reviewing study after study on the devices' effect on school security, she found that there was insufficient evidence to say whether they reduce the risk of violent behavior among students. The review did find evidence of one effect of the presence of security measures, such as metal detectors: they make students uneasy. “Certainly if kids are feeling less safe in a school and therefore aren’t learning as well. That’s something we need to be able to dig down into deeper,” Hankin-Wei said. The lack of a quantifiable correlation between metal detectors and improved safety leads some to question the decisions by many schools to embrace expensive programs. But Roberto Martinez, instructional superintendent of Educational Service Center East at L.A. Unified, said he has no doubt regular inspections led to a safer environment. He said it was obvious the first day the district implemented the devices decades ago.